Project: Brucast Vs PM Edwards. 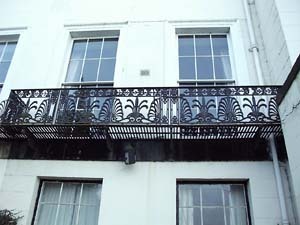 Above: Photographs of the original cast iron balconies. In 2008 we were asked by Messrs Weightmans, Solicitors, in Liverpool to act for the Claimant, Bruce & Hyslop (B&H), as an expert witness in a dispute concerning the fabrication, supply and installation of replacement cast iron railings to a Listed building in Rock Ferry, Birkenhead. Our Client had considerable experience in the manufacture and installation of replacement cast iron railings and street furniture on Victorian, or later, buildings. 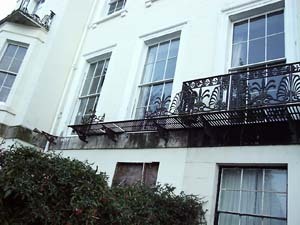 In 2005 they were approached by the owner of a listed town house in Birkenhead, seeking to replace the railings on the balconies to a pair of properties, Nos. 3 & 4 Rock Ferry. B&H removed sample panels, prepared patterns, and then cast the replacement panels. Some of these are shown in the accompanying photographs. B&H then submitted an Interim Invoice for this work. What followed was described in one of the ensuing Court hearings by HHJ Coulson as having "... more in common with the early Victorian era than 21st Century civil proceedings". The Defendant owner of one of the buildings, a Mr Edwards, declined to pay B&H. Proceedings were issued, and Mr Edwards submitted a Defence and Counterclaim. The sums in dispute were, at this stage, modest amounting to little more than some £13,700. An architect was appointed as a Single Joint Expert, a Mr J Brotherhood RIBA. He prepared a Report favourable to the Claimant. Questions were posed by both parties. Following significant delays, a second Report was produced by the SJE. Much to the surprise of the Claimant, the SJE's second Report was at complete odds with his earlier Report. It then transpired that, without reference to either the Claimant, or the Claimant's solicitor, the Defendant and his solicitor had been in contact with the SJE. The Claimant sought copies of documents and correspondence passed between the Defendant and his Solicitor, and the SJE: these were never produced. The Claimant sought leave to rely upon his own Expert's Report. The Court agreed, and set aside the SJE's First and Second Reports. The Defendant Appealed that decision, and lost. The decision by HHJ Coulson can be found here http://www.bailii.org/cgi-bin/markup.cgi?doc=/ew/cases/EWHC/QB/2009/2970.html&query=Brucast&method=Boolean. It represents one of the few occasions, if not the only occasion, upon which an SJE's Report has been set aside. The SJE continued to act as Expert for the Defendant, whilst we acted as Expert for the Claimant. A meeting of Experts was held to narrow the matters in dispute. Thereafter, an unsuccessful Mediation ensued, at which the Defendant sought to rely upon the evidence of the Local Authority's Conservation Officer, although, despite the Claimant's best attempts, it proved impossible to determine whether the Officer was acting on his own account, or was representing the view of the Authority. There followed a protracted dispute leading to trial. Prior to Trial the Defendant dismissed his legal representatives and conducted his own case. The Judge observed the matter would largely be decided upon the expert evidence. Again, at Trial, the Defendant attempted to introduce the Conservation Officer as a witness, without prior notification to the Claimant, or to the Court. At the conclusion of the case the Court found the railings were of suitable quality, and were indeed capable of satisfactory installation. Thus, the Claimant succeeded. The Defendant immediately sought leave to Appeal, which was denied. He then submitted an application to Appeal directly to the Appeal Court, in person. That application was unsuccessful. The Defendant subsequently declared himself bankrupt. Sadly, B&H were eventually forced into Receivership. Our Client's costs in the case exceeded £365,000. We understand the Defendant's own costs exceeded £90,000. The moral of the story? Suppliers must always choose their customers with care. And, sometimes, the projects one declines are more important than the projects one wins. Or, beware the vexatious Defendant? Above: Photographs of one of the moulds and of the new cast iron railings awaiting final decoration before installation.